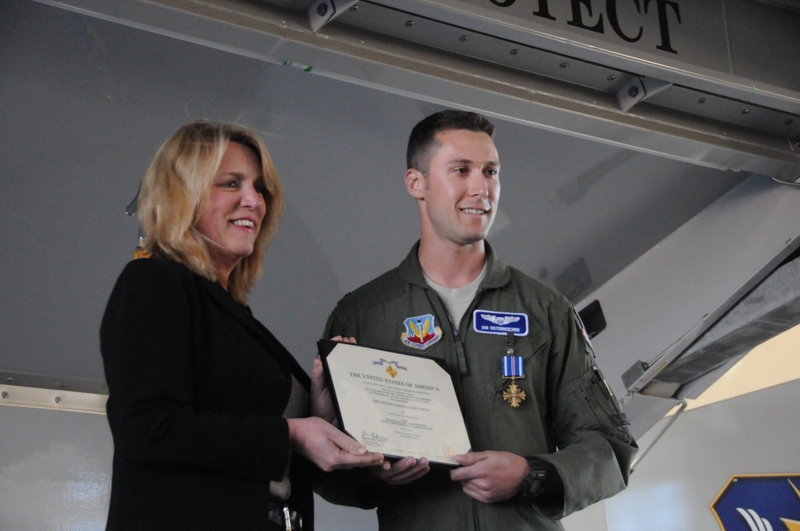 U.S. Air Force Secretary Deborah Lee James presents the Distinguished Flying Cross to former Amherst resident Capt. Ian R. Osterreicher for his action in Afghanistan at Moody Air Force Base in Valdosta, Ga., on Friday. Word spread quickly among the enemy – an American Army convoy of a dozen trucks had broken down. The lead vehicle had slid off a highway into a ravine in a remote region of Afghanistan. Pulling the vehicle free required the soldiers to set up an overnight encampment. Dozens of enemy combatants poured in throughout the night and at dawn they pounced on the 60 stranded U.S. soldiers with a barrage of gunfire from a nearby treeline. The first rounds of enemy fire critically wounded three soldiers and forced the others to take cover behind their vehicles. A desperate radio call for air support went out, and two Air Force A-10C Thunderbolt pilots flew to the rescue. It turned out to be far from easy. On Friday, some seven months later and half a world away from the dangers, Capt. Ian R. Osterreicher, a 2003 graduate of Williamsville East High School, was rewarded for his actions with one of the Air Force’s highest honors, the Distinguished Flying Cross, presented by Secretary of the Air Force Deborah Lee James at Moody Air Force Base in Valdosta, Ga.
A member of the 23rd Fighter Group, part of the famed “Flying Tigers” at Moody, Osterreicher was thrilled to receive the award, one of several he has earned, but told his parents that he did not believe he had done anything exceptional. “My son told us he was doing what he was trained to do, but the fact is he and another pilot saved the lives of 60 soldiers that day,” said Mickey Osterreicher, an attorney who attended the ceremony along with Ian’s mother, Julia White, and Ian’s sister, Elena Trapp. According to an Air Force account of the July 23 actions, the two pilots stationed at Bagram Air Base were already airborne when they received the call for help and were able to quickly locate the pinned-down convoy. Osterreicher, the lead pilot, and his wing man realized the situation was worsening as the enemy forces moved in, apparently aware that if they positioned themselves close enough, the pilots might not risk shooting for fear of harming Americans. But with the enemy now within grenade-lobbing distance of the convoy, the ground commander granted the pilots permission to engage in “danger-close” aerial combat. Flying in at 75 feet above the enemy’s position, Osterreicher and his fellow pilot could clearly see the enemy and fired relentlessly during 15 gun runs over the course of two hours. Several rockets and three 500-pound bombs were also dropped on the enemy. The pilots’ aim was so precise that no U.S. soldiers were harmed by friendly fire and, at last, the enemy retreated and a helicopter rescued the wounded soldiers. Afghan army soldiers later returned to the battle scene and found the bodies of 18 enemy combatants. Dozens more were believed to have survived and fled. Osterreicher and his wing man, after being debriefed, visited the hospital at Bagram Air Base and met with one of the wounded soldiers, who expressed his gratitude. “Thank you for shooting those bad guys,” the soldier said.